We have been SW Florida residents for almost 3 years. Retired for the second time in 2012, sold the house and everything else, and traveled full time in our fiver. Loved the full time life style but after watching the home prices in Florida start to rise we decided to purchase another home. Have been traveling during the summer in a Thor Challenger Class A gas MH. Just before Irma we decided to sell out and go back to full timing. We had just talked to a realtor and began our search for a used 42 to 45 foot DP. Now we are back home and ready to continue our plans and this certainly looks like a good place to get valuable information. How did you fare in Irma? We have a number of friends in FL. A lot less damage to their particular areas than anticipated. Irma with a west jog, saved a bunch off folks and it kept on moving, unlike Harvey that stalled out for a week! Having said that, just what is it that you would like to know? We did better than most in SW Florida that's for sure. A little damage to a storm door was about all. Even though our home was almost hurricane proof I still expected some damage. Glad it kept moving, we certainly did not need the extra rain! Right this second we have not located a used DP we are seriously looking at, so I am just reading through some old posts and trying to get a feel for how steep the learning curve will be going from a gasser to a DP. I'm waiting on insurance adjusters after Harvey and MH might be totaled. I'm looking also...hope we don't collide in looking. Good luck to you in finding what you want. Welcome to FMCA and the forum. We loved our full time travel and are on the road about the same amount of time now that we were when we were full time. If you are in it for the long term, consider getting the most solid coach you can afford. We're at 167,000 miles right now. Wonderful that your home escaped the worst of the damage. I don't know how the housing market will be in the near future. Our house went on the market in the summer of 2001. It took a few months but it finally sold. Be patient with the sale. I was wondering how your situation with your MH turned out. Sorry to hear your rig may be totaled. We were hoping for a little rain in Hondo but got less than 1/2". It all stayed around San Antonio and farther east. Anyway, we hope you receive a quick and easy settlement with insurance and a speedy and painless search for a replacement. You both need to look at Motorhomes of Texas, PPL and anything North of San Antonio and West off Abilene. Texas! Sorry for your loss, Wayne! I feel blessed, my old home on Galveston Island, survived Allison and Rita. No damage! Now the new House, built 2007, survived IKE and Harvey, also with no damage! In Texas at least we have sticks & bricks on stilts, in most coastal communities....I personally feel that "floating foundations", should be mandatory in all coastal towns Nation wide and Tornado Alley! As my saying goes: It is what it is, and then it is what you make of it. Just wish the insurance company would hurry a little. ISPJS, let us know when you find something. 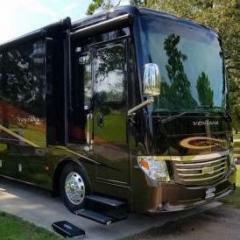 Manholt, I checked Motorhomes Of Texas site. 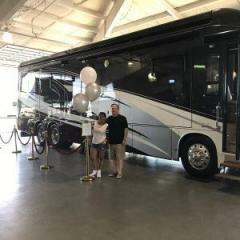 They have a pretty good selection and actually if they were closer and we had a contract on the house there is a 2011 43' Tiffin I would probably at least call them about. We have looked at a couple 43' to 45' used coaches at North Trail (Ft. Myers) plus we keep checking Lazy Days site (Tampa). Both of those dealers are close to us and have a slightly larger selection than Motorhomes Of Texas. I'm not totally hung up on getting either a used Newmar or Tiffin, but the ones we have actually looked at so far I have been extremely impressed with. Wayne77590, I'm sure you will know when I find one. I'll probably have a million questions when it is time to do a PDI on it. When we got back from our Irma escape and was parking our MH back in storage the manager came by. He said there was a fiver that got blown around sideways but didn't hurt the landing legs. The only real damage was a large Class C. Somehow the rear of the roof raised up when our winds were 80 to 90mph, but then went back down a few hours later when the winds did. The owner came to check on it the next day and didn't see any evidence of damage. He opened the door and water came blasting out from inside. Totaled. I liked the 2011 Itasca Elipse at MoT. There are a lot of used MH's out there right now. Most likely as soon as the insurance adjuster settles with us they will all be gone and it will be like a needle in a haystack. I looked at the Challenger a few years ago (2016 with the nice shiny wood). Nice coach, bought a FR Georgetown XL instead and that was a MISTAKE. A 38' coach with a v-10 gas engine just doesn't have the oomph IMHO especially pulling something. Seemed to always be screaming even just on a Interstate overpass. Same F-53 drivetrain as the popular Thor ACE that really performed well with that combination because its smaller and lighter with the same engine. You won't regret going to the Diesel. Not much to learn, lots of diesel stations out there. Keep it maintained (which is easier and less frequent then gassers) and it will quietly take you everywhere you want to go. Thanks Bill, I have been through their site and many others, Lazy Days, RVT, etc. Lots of them meet the eye but many do not. I'm aghast at a MH's that have two couches opposing each other and a pop up TV behind one of them. It has to be a single couch/hide-a-bed and a Euro chair or recliner. Either one as I'll replace it with the one I have now. It has narrowed my available coaches. We cannot do anything until I know what the insurance company is going to do. We'll be so glad when it is over. Our service manager said that even after the adjuster inspects the MH it could be a month or more before he settle up with us. Oh well. It to shall pass. It is, what it is...bla, bla, bla! To me, max gasser length is 34'..you can throw a Banks on it, but your still stuck with 5K tow restriction! Ugh. Biggest robber is the weight of the slide's! Our service manager said that even after the adjuster inspects the MH it could be a month or more before he settle up with us. This must be different than auto insurance. When I had my shop, many times the adjuster would write a check and hand to the owner if he was there or it never took more than a few days for snail mail to get the check delivered. The insurance company wants to get it settled since they will be paying storage charges until its removed from Dues. Like I said, maybe motorhome insurance is different. BTW...if at all possible, be there when the adjuster is there. Most, if not all adjusters don't have a clue on costing out repairs on a motorhome. There are no computer programs like the estimating programs for cars. My experience has been the shop will tell the adjuster what its going to cost to repair and thats what they go by. I'm going to have a print-out of the RV NADA information to hand to him and If I can get the amount indicated or close enough I'll be happy. I have indicated I want to be there when the inspector is. Last couple times I have used insurance there was a slight delay in getting the check. They did not write the check on the spot. With the volume of paperwork they are experience with the different catastrophes I'm sure there is going to be some sort of bog down. When my Scarab Race boat blew up....it took Progressive Insurance 3 months to settle...I asked why so long, "we had to get a salvage company to bring it out of the Galveston Bay and then we had it inspected, when it was deemed to be a total loss, we settled"! Progressive insures everything, but as Jim said, they only know cars! The bog down will be the $$$ and those who counter claim, Boo Hoo, my stuff is worth a lot more that those other peoples! How close to NADA info do the companies settle? Pre blow out, my boat was insured for $140,000, I got $78,000+/-, owed the Bank $64,000+/-...the difference was equal to one year premiums! Just saw your signature. So sorry. I did have a slight chuckle at the irony of your message. Hope you and the Insurance Company reach a satisfactory solutions soon and you will find a new coach soon. Were you'll able to salvage anything from the coach? Let us know if there is anything we can do to help. Wayne, caveat to that "help thing". If you want it dismantled, call Herman, he's a way better demo man, than me! Other than that, I want to hear that your "on the road, again"!